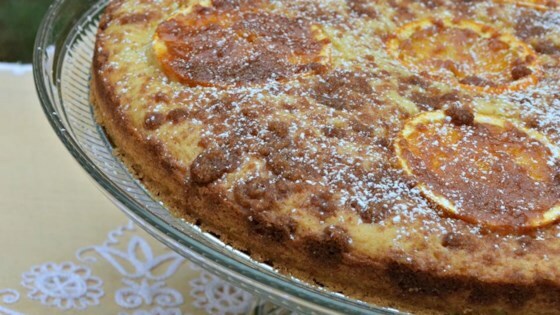 "Best served warm from the oven, this moist cake is a delicious combination of orange and cinnamon flavors." Preheat oven to 350 degrees F (175 degrees C). Lightly grease a 10 inch round cake pan. In a small bowl, mix the brown sugar, cinnamon, 1 tablespoon flour, and 1 tablespoon melted butter. In a large bowl, mix the 2 cups flour, white sugar, baking powder, baking soda, and salt. In a separate bowl, mix the 1/2 cup melted butter, orange juice, orange zest, and eggs. Stir the melted butter mixture into the flour mixture until well blended. Transfer to the prepared cake pan. Sprinkle with the brown sugar mixture. Bake 30 minutes in the preheated oven, or until a knife inserted in the center comes out clean. I made this cake and it turned out to be VERY dry and not very tasty either. This is delicious! I made it the night before and heated it up in the oven for breakfast. Yummy! It was pretty good. The orange and cinnamon did go well together, but the cake was a bit bland. This was so tasty and light! I was a little worried about the consistency as I put it in the tin but it turned out perfectly. Definitely making this again! The cake came out moist and tasted like orange cake. I'm probably going to throw some dried cranberries in next time.